Explore this hands-on activity to learn the different ways light is created. We take it for granted, but when you think about it, light is amazing. light allows us to see the world around us. Animals and humans use light to do all kinds of very practical things every day. But do you know how light is created? Basically, light is energy -- specifically electromagnetic energy. Electromagnetic energy travels in waves of varying lengths. Some are very long radio waves, some medium, and other are very short gamma rays. The human eye can detect only a small portion of this spectrum of waves. What we can see is called Visible Light. To create light, another form of energy must be supplied. There are two ways to do this: incandescence and luminescence. If you heat something to a high enough temperature, it glows. That's incandescence. Old-style light bulbs, fire, and the sun & other stars are incandescent. Hot light. The cooler way that light is created is called luminescence. That's any light that's not created by heating. 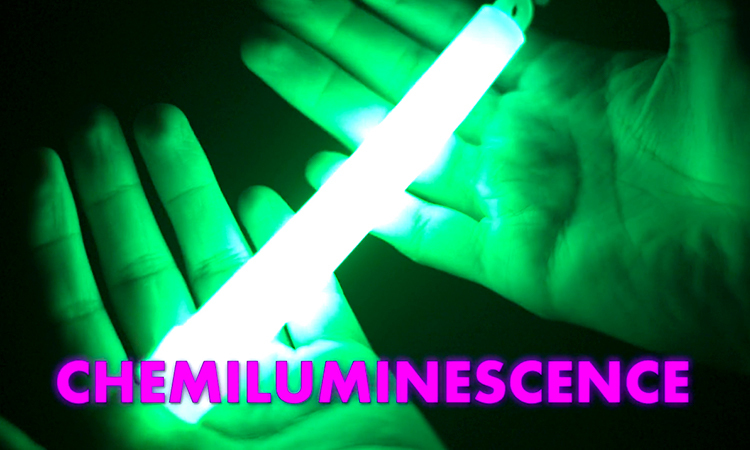 In this activity we will feature 3 types of luminescence: fluorescence, phosphorescence, and chemiluminescence. We'll be using: glow sticks, glow-in-the-dark stickers, laundry detergent, flashlights, and ultraviolet light. And you'll need to be able to turn out the lights. This is an example of luminescence - called fluorescence. In fluorescent substances, energy from one color (or wavelength) of light is converted to another color. And these substances can only "fluoresce" - or emit light - as long as the external energy is supplied. This is an example of phosphorescence. Phosphorescent materials absorb energy from radiation, like light, and slowly re-emit it. Unlike fluorescent materials, phosphorescent materials can produce light for a long time after the external energy source is removed. This is an example of chemiluminescence, which in most cases is the kind of light bioluminescent animals create. In this case, breaking the small tube inside the glowstick releases chemicals to mix with other chemicals in the outer section of the glowstick, causing the glowing reaction. We hope this has been illuminating. Check out the NOAA Ocean Explorer "Deep Lights" lesson plan, from which this video was adapted, for further exploration of luminescence. Light may be detected as far as 1,000 meters down in the ocean, but there is rarely any significant light beyond 200 meters.